Another day, another new indie brand for me to try and you to see. Today it's Jindie Nails. 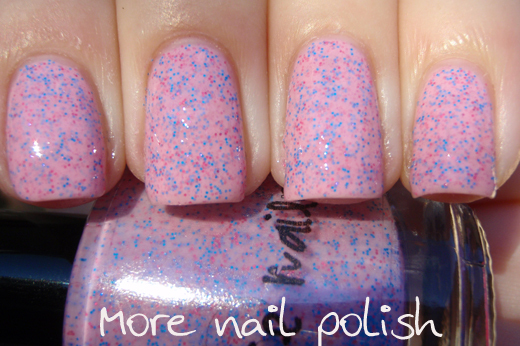 Talk Nerdy to me - Pale pink cream/jelly base with matte pink and blue hex glitter. Very easy application and smooth coverage in two coats. The fine matte glitter dries a little gritty, so I did two thick coats of top coat. Candy Land - I want to love this so much, in fact I really love the idea of this, but I have to say that I found it incredibly hard to get the glitters out of the bottle - even after standing it on it's head for ten minutes as instructed. I don't think I ended up with any of the orange neon glitters on my nails at all. Because I wanted to have some nice glitter coverage, I chose to wear this on it's own, rather than layering over white. This was five coats, and even then my ring finger only got four pieces of glitter on it. The final look was very sweet (pun totally intended) but I just wish I didn't have to do five coats to make it look like this. On the up side, even at five coats, it dried very quickly and I was able to apply Seche Vite top coat and head to bed minutes later and not end up with sheet marks on my nails. Jindie Nail Polish is available from the Jindie Nails website (when open) and through Llarowe. Seche Vite is amazing! It is a bit moody, so I recommend looking up usage tips online. But when you get the hang of it--changes your polish life. Candy Land looks great - the base reminds me of fondant icing but it does sound like quite a lot of effort. Talk Nerdy is really cute! Talk Nerdy To Me is talking to me.